My name is Katja Pumm. Thank you for visiting the Louisiana v. Vincent Simmons blog. 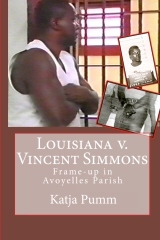 It is meant to be a follow-up on the true crime book Louisiana v. Vincent Simmons: Frame-up in Avoyelles Parish, which was published on April 6, 2011. I worked many years on the case and its background trying to find out what really happened. One thing is certain: There is not anything like a fully complete story. The book only can contain what I knew by the time I submitted the manuscript for printing. Because I do not possess any clairvoyant abilities, and the case is still unfinished business, I intend to add relevant news to the story on this blog. Louisiana v. Vincent Simmons: Frame-up in Avoyelles Parish reveals how the political system furthers wrongful convictions and why exculpatory evidence does not always free innocent prisoners. I think the About page is a good place to start reading. Visit the book trailer and have a look inside the 376 pages on the Preview page. A case summary with documents and more are on the Innocent in Prison Project International website at http://cases.iippi.org/vincent-alfred-simmons/. The blog enables you to comment each post. So, if there is something that comes to your mind while reading my lines and you want to share it, I would be happy to read from you here.